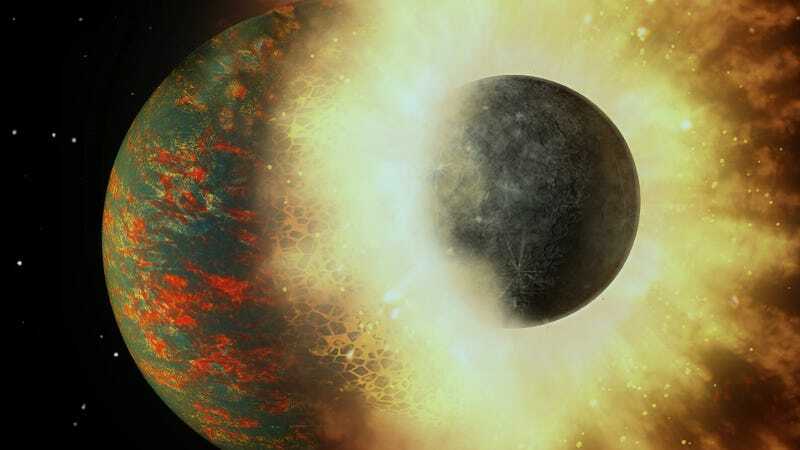 Researchers from Rice University say that around 4.4 billion years ago, a Mercury-like planet smashed into Earth, seeding our primordial planet with life-giving carbon. Had this never occurred, it’s an open question as to whether or not life could have ever emerged. Geoscientists have struggled to explain how life was able to arise on Earth given that most of the planet’s carbon—an important prerequisite for life—should have either boiled away during the planet’s earliest stages or become trapped within the Earth’s core. 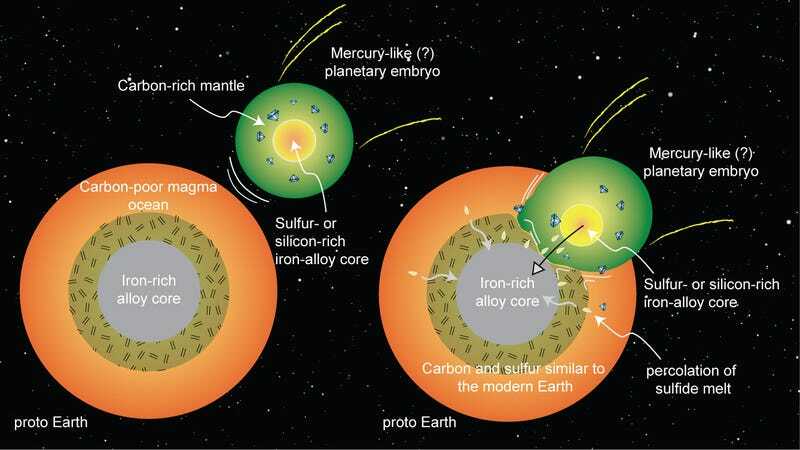 By conducting high-pressure and high-temperature experiments in the lab, researchers from Rice University have concluded that virtually all of our planet’s carbon likely arrived when a Mercury-like planet smashed into the young Earth some 4.4 billion years ago. Scientists aren’t entirely sure how Earth’s volatile elements, such as carbon, hydrogen, nitrogen, and sulfur, were able to remain outside the Earth’s core and stay locked within the mantle. Models show that most of our planet’s carbon should have vaporized into space, or ended up in the metallic core of our planet, sucked up by its iron-rich alloys. Prior to the new study, many scientists speculated that these volatile elements came to Earth after our planet’s core finished forming. 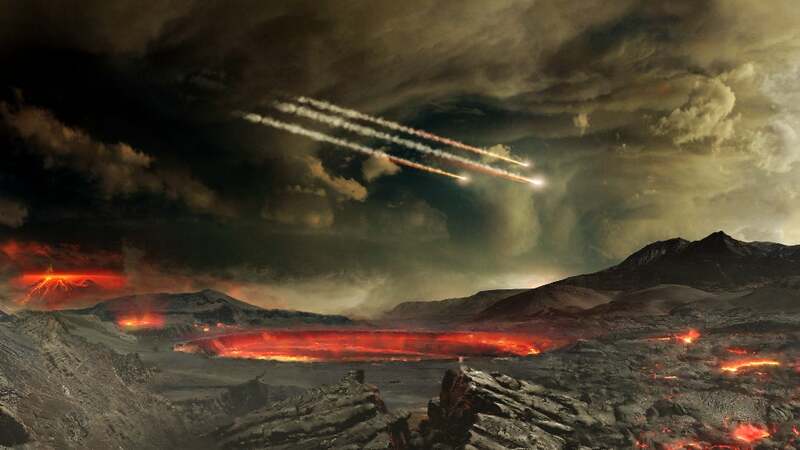 As Rice University geoscientist and study co-author Yuan Li pointed out in a statement, “Any of those elements that fell to Earth in meteorites and comets more than about 100 million years after the solar system formed could have avoided the intense heat of the magma ocean that covered Earth up to that point.” Trouble is, there are no known meteorites capable of producing the required ratio of volatile elements. Three years ago, Li and his colleagues began to take a different approach to the problem. They conducted a series of experiments to assess how carbon’s affinity for iron may have been altered by other compounds present in the Earth’s early environment. Importantly, they considered the potential role of other celestial bodies with characteristically different chemical compositions. Their experiments recreated the high-pressure and high-temperature conditions found deep inside the Earth and other rocky planets. Results showed that carbon could be excluded from the core and relegated to the Earth’s mantle, provided that the iron alloys in the core were rich in either silicon or sulfur. One scenario that explains this particular ratio is that an embryonic planet—one that already formed a silicon-rich core—slammed into Earth, and was absorbed by Earth. “Because it’s a massive body, the dynamics could work in a way that the core of that planet would go directly to the core of our planet, and the carbon-rich mantle would mix with Earth’s mantle,” said Gupta. It’s important to point out that evidence for this primordial collision is circumstantial as best. The researchers agree that more work is needed to support this theory, including analyses of abundant elements other than carbon. If true, however, it could mean that Earth only became a habitable oasis only after this tremendous cosmic smashup. Carbon forms a key component of all known life on Earth; complex molecules are comprised of carbon bonded with other elements, such as oxygen, hydrogen, and nitrogen.